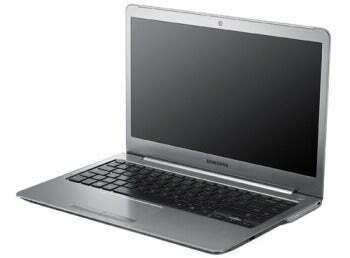 Samsung on Monday unveiled its first official Ultrabook contenders, a 13-inch and 14-inch Series 5 Ultra model laptops. The 14-inch model not only has the largest display of any ultrathin laptop currently dubbed an Ultrabook, it also is the first to pack an optical disc drive. 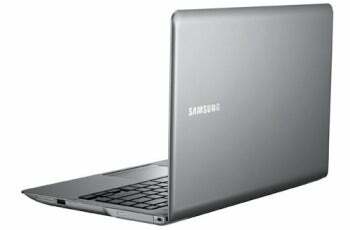 Samsung has ventured into the ultrasleek laptop field before, with its Samsung Series 9, considered by many to be the first viable competitor to the Apple MacBook Air. At a starting price of $1649 for the 13-inch Series 9, however, the Series 9 is also ultra-expensive. Now riding the Ultrabook wave, Samsungs’ new Series 5 Ultra laptops are a bit more affordable and, in the case of the 14-inch model, unconventional. By and large, Ultrabooks, based on Intel design specifications for this new breed of laptops, are under 0.8 inches thick, feature solid state drives (SSDs), and have 13-inch displays (so far, the 11-inch Asus Zenbook UX21 is the only one without a 13.3-inch screen and the Acer Aspire S3 eschews the solid state drive for a less expensive hybrid SSD/HDD). The Samsung Series 5 Ultra 14-inch model, which Samsung is lumping into the Ultrabook category, is larger and heavier than other Ultrabooks: 4 pounds and 0.82 inches, to be exact. You can thank the optical disc drive and larger screen size for the bigger dimensions and weight. Fitting a DVD drive into a device so thin is a great feat—something other ultrathin laptop makers (including Apple with its MacBook Air) haven’t done yet, but then again you might think optical discs are going the way of the dinosaur these days anyway, thanks to cloud computing. Also remarkable, however, if you consider the Series 5 Ultra 14-inch laptop an Ultrabook: It will offer up to 1TB of hard disk drive storage and an option for a Radeon HD 7550M graphics card. Both are unheard of so far in the Ultrabooks space. The Series 5 Ultra 13-inch model fits the Ultrabook bill more closely, except it also offers a hybrid drive option: 16GB SSD for Windows and up to 500GB HDD for all your data. Both laptops will offer an Intel Core i5 processor, HDMI and Ethernet ports, matte screens, and that smooth aluminum chassis we’ve come to expect on super-thin laptops. The 13-inch model is expected late this month for 1.49 million Korean won (approx.. $1300 USD), while the 14-inch laptop will start at 1.54 million won (about $1345).